Northam told King that he wanted to clarify his confusing statements regarding a racist photo on his medical school yearbook page. Northam’s page in the 1984 East Virginia Medical School yearbook contains a photograph of two people — one wearing blackface and another in a Ku Klux Klan costume. He initially said that he was pictured in the photo, but later said he was not. “I’ve always been– a transparent person. And I just thought it was important to– to let people know that– that that wasn’t me. That’s– not who I was– at that time. And it’s certainly not who I am now, after 35 years of service to– to this country and my commonwealth,” Northam said. Northam did admit to darkening his face on a single occasion in 1984 when he dressed up as pop singer Michael Jackson. GAYLE KING: I’m marveled that you are still standing when so many people have said you’ve got to go and you’ve got to go now. I’m thinking he’s either got a lot of confidence or he’s just a little crazy. GOV. NORTHAM: Well I know in my heart who I am and I know what I can do and Virginia, right now, needs a leader that’s strong, that has courage and that can take us to the next level, and I can do that. GAYLE KING: You might have to convince people that you are still the right leader for this job. You have a lot to do. GOV NORTHAM: I have a lot of work to do. But I will do everything I can to regain Virginia’s trust. 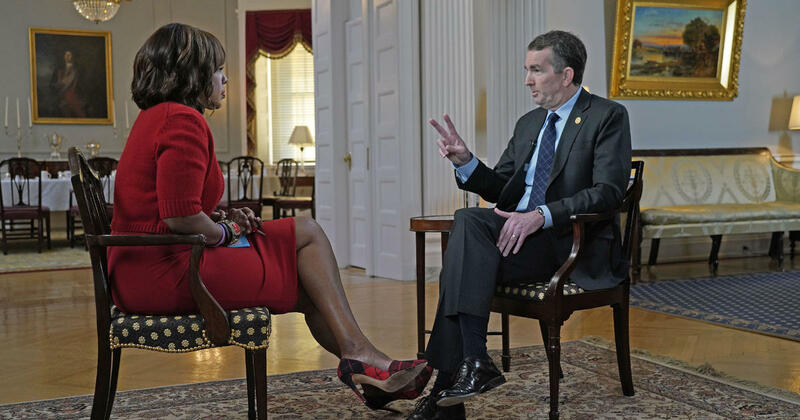 RALPH NORTHAM: Saturday was– a very busy day. I did talk to my– my wife– my close colleagues. And I– I just made the decision that we– we need to clarify this. GAYLE KING: But was there some concern with people saying, “Governor, now, you’re gonna really look crazy”? RALPH NORTHAM: Well, I’ve always been– a transparent person. And I just thought it was important to– to let people know that– that that wasn’t me. That’s– not who I was– at that time. And it’s certainly not who I am now, after 35 years of service to– to this country and my commonwealth. GAYLE KING: –about, “He needs to go. He needs to go,” by people in your own party, by some of the top Democratic leaders in the country– by some of your constituents, who were protesting outside your home. And after that happened, you thought what? GAYLE KING: –and why you think you still deserve this job, when so many people are calling for you to step down. RALPH NORTHAM: Well, again, we– we have worked very hard. Right now, Virginia needs someone that can heal. Virginia also needs someone who is strong, who has empathy, who has courage, and who has a moral compass. And that’s why I’m not going anywhere. GAYLE KING: You know, the other thing that struck people in the news conference is when you were talking about Michael Jackson. And you said, you know, “Because — many people know it’s hard to remove shoe polish from your face.” And I’m thinking– how do you know that? GAYLE KING: Because it implies that you’ve certainly put shoe polish on your face on more than one occasion. How do you know that it’s difficult to remove? GAYLE KING: I didn’t know that. GAYLE KING: On your cheeks. GAYLE KING: My dad used to do that. RALPH NORTHAM: Yes. And the shoe polish goes through that cloth. And it gets on your finger– or my finger. And it’s very difficult to remove. So that– that’s why I know shoe polish is difficult to remove. GAYLE KING: From the very beginning, you said you were not stepping down. But the story has certainly changed. Are there any circumstances that you would step down? GAYLE KING: Wouldn’t you have preferred to have this unique opportunity another way? RALPH NORTHAM: –again, I really do believe that things happen for a reason. Gayle KING: And happened to you. GAYLE KING: And what do you think that reason is? RALPH NORTHAM: That we are in a position to– to learn. I will focus on race and equity. That’s something that, for the next three years, is gonna be my commitment to Virginia. And I really think we can– make impactful changes.